So the wife was out of town and I had no motivation to make anything. I didn’t have a meal planned and eating out / fast food is a lot of work on keto. 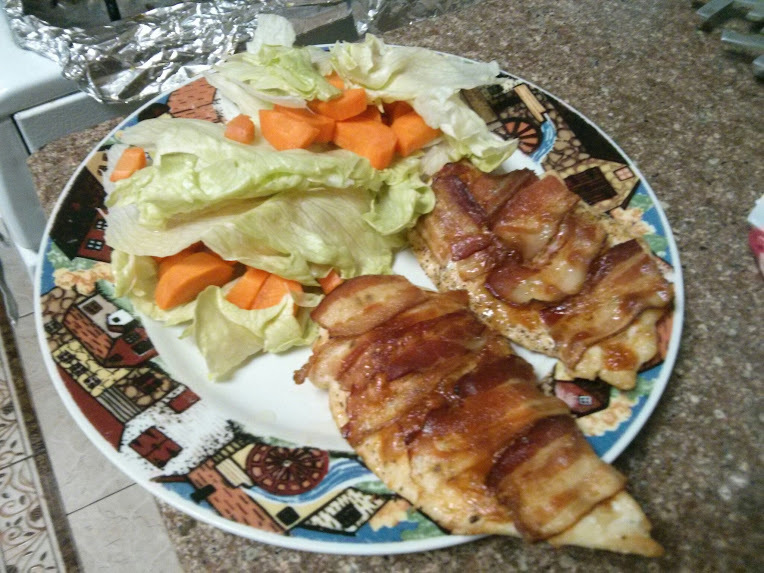 Enter Lazy Keto Chicken! 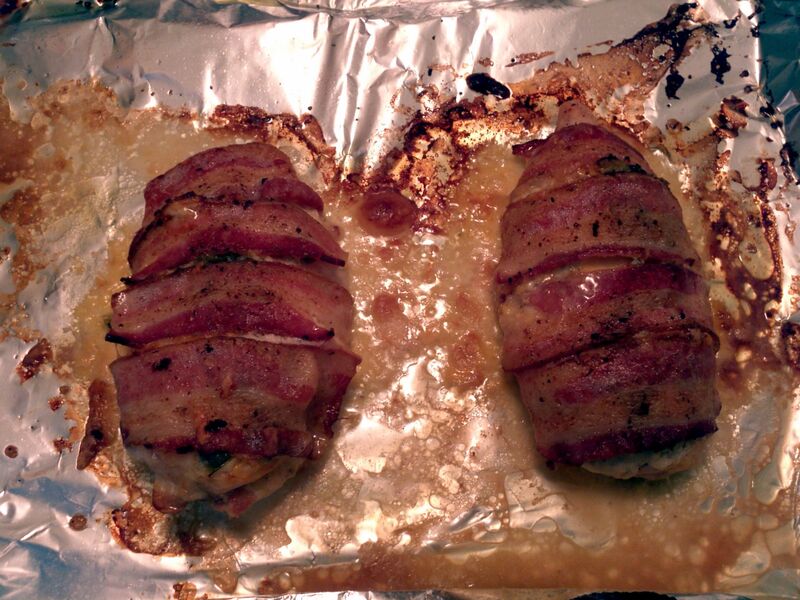 In the past I’ve made complicated dishes like stuffed chicken, but I was thinking, could I make it even easier? Its a lot of work to cut a perfect pocket into a piece of chicken and perfectly wrap it in bacon. So instead, I decided to just layer it all and see how it went. It actually turned out really well and was super easy! I started with two chicken breasts and seasoned with salt and pepper. Then I just covered them with cheese, and threw some jalapeno slices on the cheese. These jalapenos are just from a jar you can keep in your fridge. Then, instead of wrapping the chicken in bacon, I just placed the bacon on top of the chicken. Then I transferred the chicken to a foil lined pan. 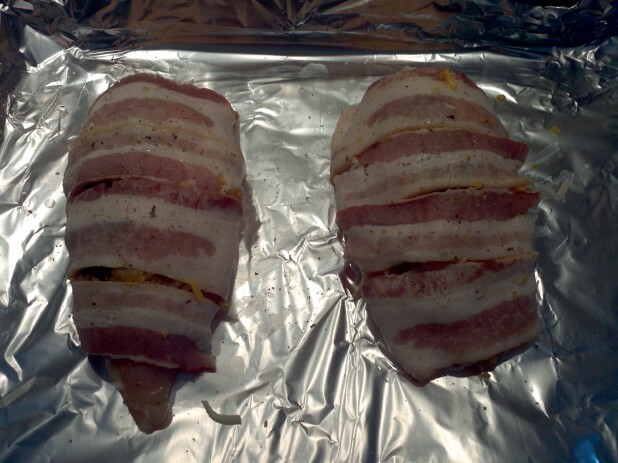 When I transferred it, I just tucked the ends of the bacon under the chicken. And then its done! I just cooked it at 350 degrees in my toaster / convection oven until it is done. If it looks done but the bacon is not yet complete, I throw broil on for a bit. I’ve been making this one for a while. I prefer mozzarella over cheddar, and also stick in a few asparagus spears. I wonder if microwaving the bacon for a minute or two would allow the meats to cook more evenly? I think I will try it and see. :-). Thanks for the great and easy recipe! Made this last night for dinner – whole family loved!!! Thanks! Hey! I made this for dinner tonight, it was amazing and super easy to make. I’m just starting Keto and so far your recipes have been the easiest and best looking/tasting! I expect more great things from you! I just made this today, and it was amazing! Thanks for all the cooking ideas. 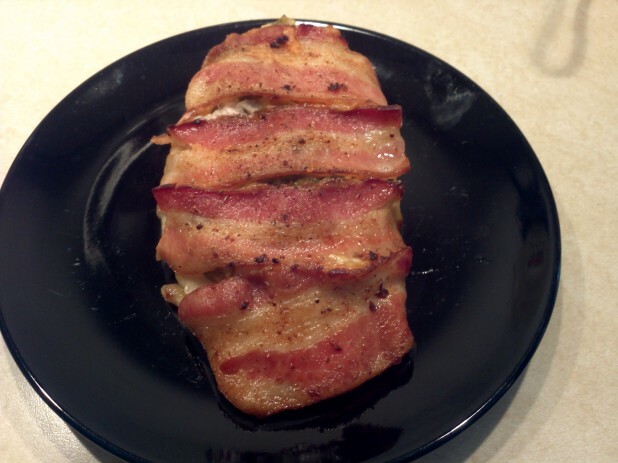 This looks good…..I think I need to stop looking at this site…It’s making me hungry LOL!!! It’s after 10:00 pm … not a good time to make yourself hungry! Just made your recipe and it was awesome! Literally 5 minutes prep time, sit around and watch some podcasts for 45 minutes….take it out of the oven, ready to eat, and I have lunch for tomorrow too. Hahaha I do the exact same thing! Never tried jalapenos though. Might have to try that next time. That looks amazing! I look forward to trying it out! Someone on Reddit posted a like to this and I’m so glad they did! God sir thank you for this. 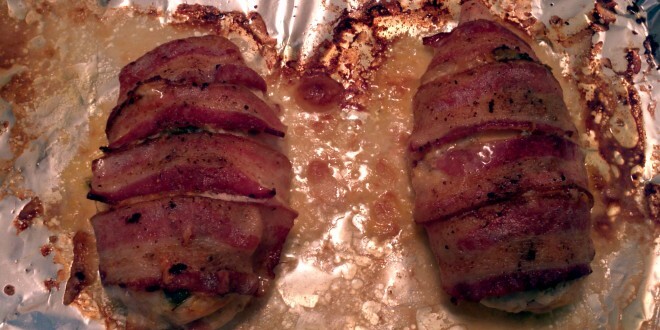 It tasted amazing and was so easy to do that I (who hates cooking) was able to do it. It appears there was a minor typo and its 70 instead of 79. But yes unfortunately chicken has a super high protein to fat ratio. 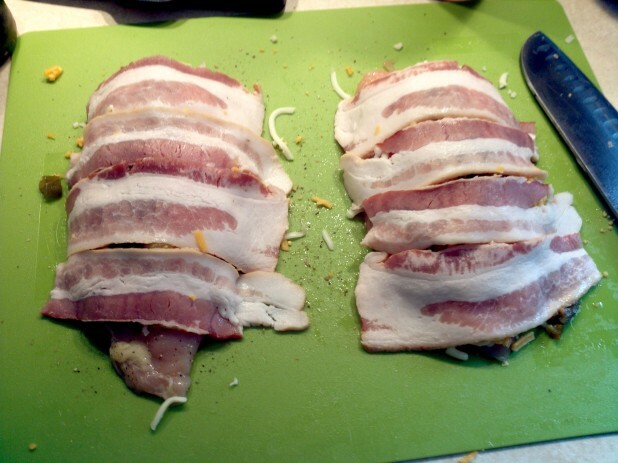 It ends up being 48 for the chicken, 8 for the bacon and 14 for the cheese. 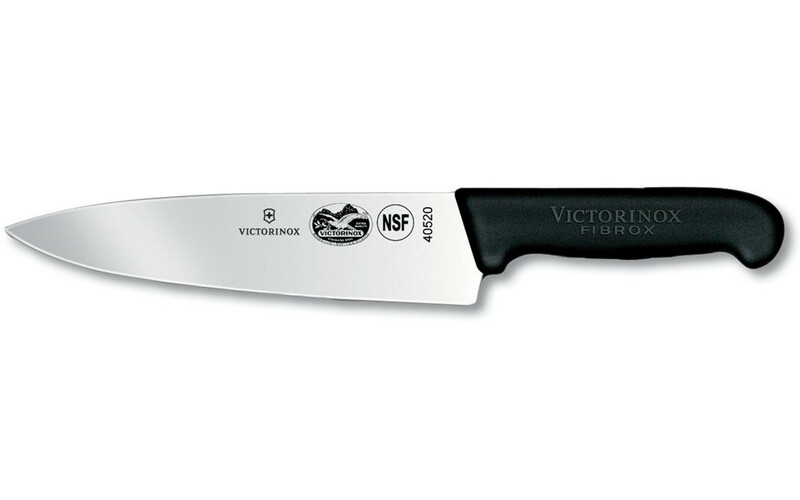 You’d definitely want to pair this with a fatty side to keep your ratios correct. 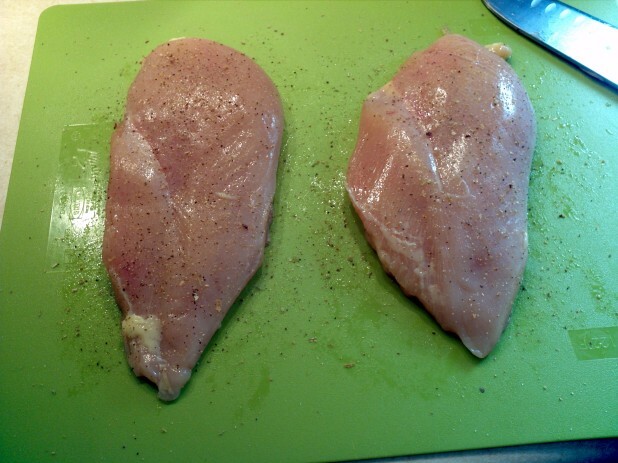 What about using boneless chicken thighs instead of the breasts? Wow! Just made this for lunch and it had to be one of the best chicken dishes I’ve ever made. That’s smart! I cook a lot, but never thought of this recipe. Thanks! Great recipe! 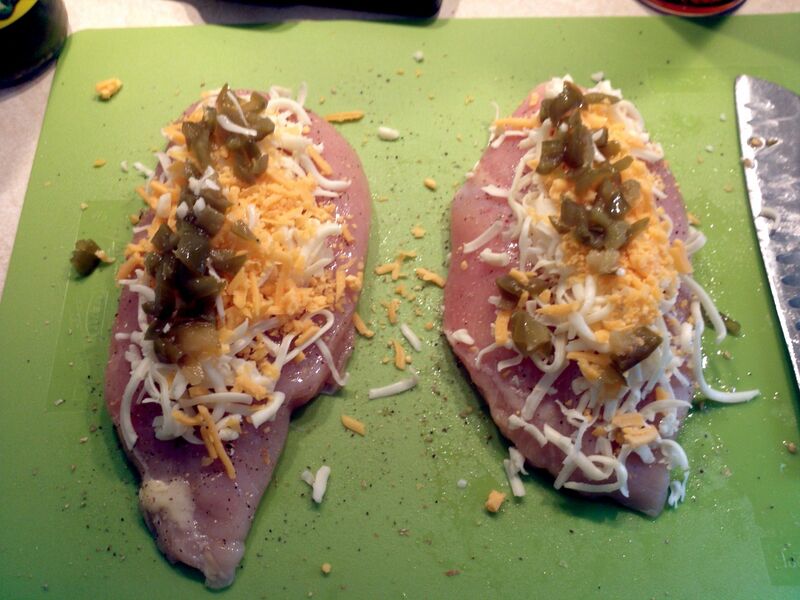 I’ve been making it with cheddar or jack cheese, added some chopped black olives to the jalapeños, seasoned the chicken with chili powder, garlic powder, cumin, & salt. Drizzle some olive oil to up the fat, pair with a salad or cooked greens — it’s a winner! Thanks! Wow,thanks for this! It was really tasty! I have to say I did not believe too much in it, cause my trials of chicken in the oven were either coming out as a soup or too dry. Due to the bacon, this was perfect!!! Surprise – surprise, I could only eat one of these babies, can you please share how you usually reheat it? Microwave makes it soggy and oven perhaps drying it too much? Thanks in advance! Having a hard time entering this recipe in myfitnesspal. It keeps saying its over 1000 calories. Also, is the serving size correct? Is it 2 breasts per person or 1 breast per person? THIS TASTES DELICOUS! This looks s good!. I love your recipes! Made this last night using chicken thighs. I removed the bone and skin. Instead of shredded cheese, I just laid a think slice on top before adding the jalapeño and bacon. 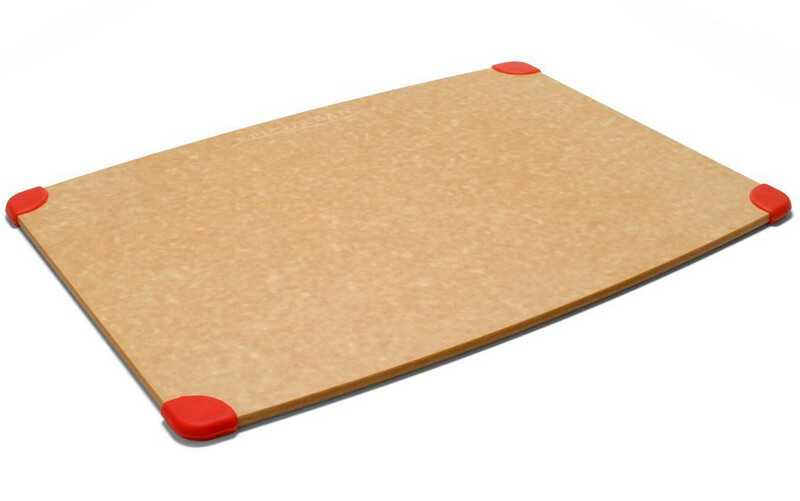 Once assembled I hit each thigh with a sugar free poultry rub. Fantastic. I’ve just started trying to prep meals on a weekly basis and this recipe will be in heavy rotation. Thank you. Does this reheat well? I would think the bacon would get chewy and the chicken dried out. 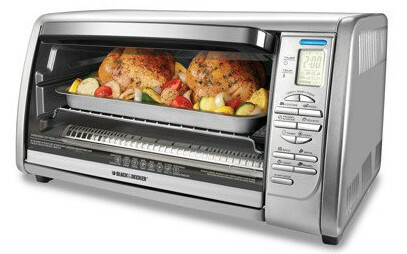 I don’t have access to a broiler during the workday – only a microwave. Thanks! Made this today. Awesome! Thank you for the recipe.